Cat Welfare Association: Purrs & Purse, Shoes & Jewelry Too! 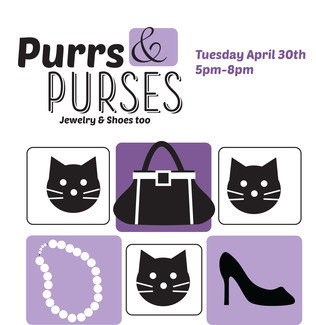 Purrs & Purse, Shoes & Jewelry Too! Join us on April 30 from 5 pm - 8 pm at Ideal Party House (1039 Mediterranean Avenue) for a special Spring sale hosted by The Catique. Upscale and designer handbags, shoes, boots and jewelry will be featured. Light refreshments will be served. There is no charge for admission but a reservation is required. Looking forward to finding fabulous bargains!